You can place our Online Dictionaries and Translators on your site for free. We would like to offer you the opportunity to place our online translation forms on your site. Word and sentence translations are possible from English to Polish and vice versa. We believe that it will be an attractive benefit to the Polish-speaking visitors of your site. To get the HTML code please choose the necessary forms below and input your e-mail address. We will send the HTML code to you via e-mail immediately. To place the chosen forms on your site simply place the HTML code into the area where you wish to see the Dictionary or Translator. Your e-mail address will be added in the Ectaco News mailing list. 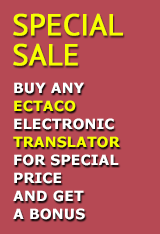 Copyright info: Ectaco Online Dictionary or Translator placed on your site must bear the company name - "ECTACO Online Dictionary" or "ECTACO Online Translator".